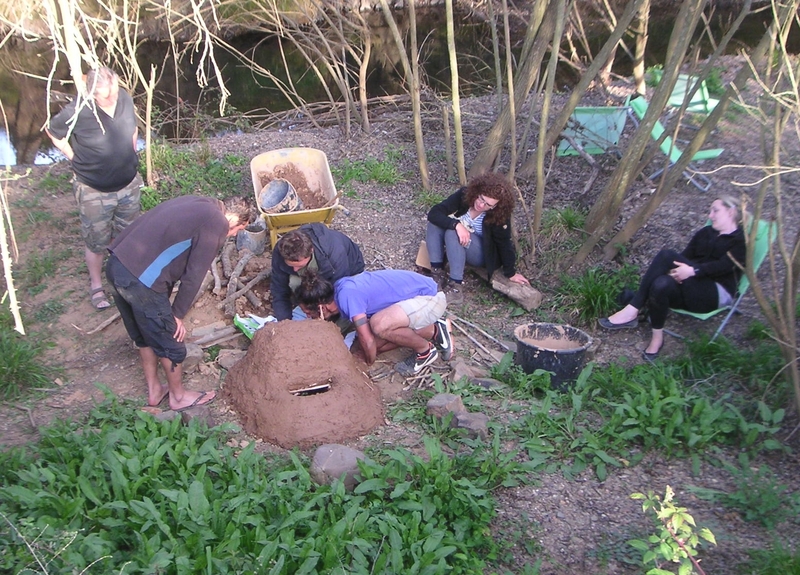 Thorsten introduced the plan to build a clay oven. We have plenty clay and it was quickly built near the river. Today we are firing it up for the first time and soon we can bake our breads, pizza’s and cookies here. Also in this picture Steve who just returned from the north standing at left, and Silvia, our new Chef de Cuisine recently arrived from Germany sitting at the right. 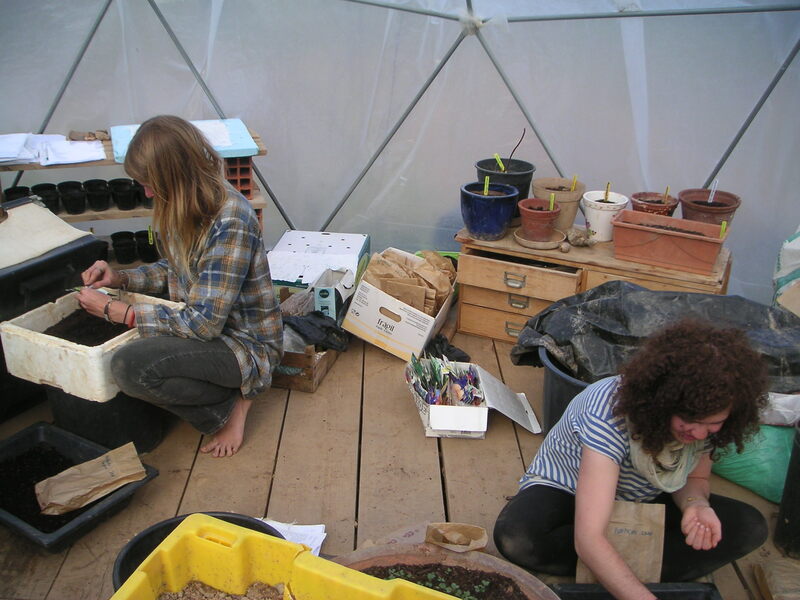 The garden dome is now full of seed trays and gradually we are planting some seedlings out already. The weather is fine but there is still a risk of night frost. I feel like we are too inexperienced in many ways but still things work out fine and today we harvested the tastiest carrots and the best Rucola salad you cannot buy in any supermarket. In the picture Ellen from Sweden and Jule, filling trays with pumpkin seeds. We have not been able to use the road behind the house for some time. But now the cables to the solar panels are in the trenches and here you see some of our new friends filling the earth back in. They are Jule and Thorsten from Germany and Joakim from Sweden. We are all enjoying the warm and sunny weather, some are even complaining about the heat at times. We are making new connections and they all need to be below ground so much digging has been happening lately. One can hardly walk around with all the trenches and Xicca jokingly called it a holy place. 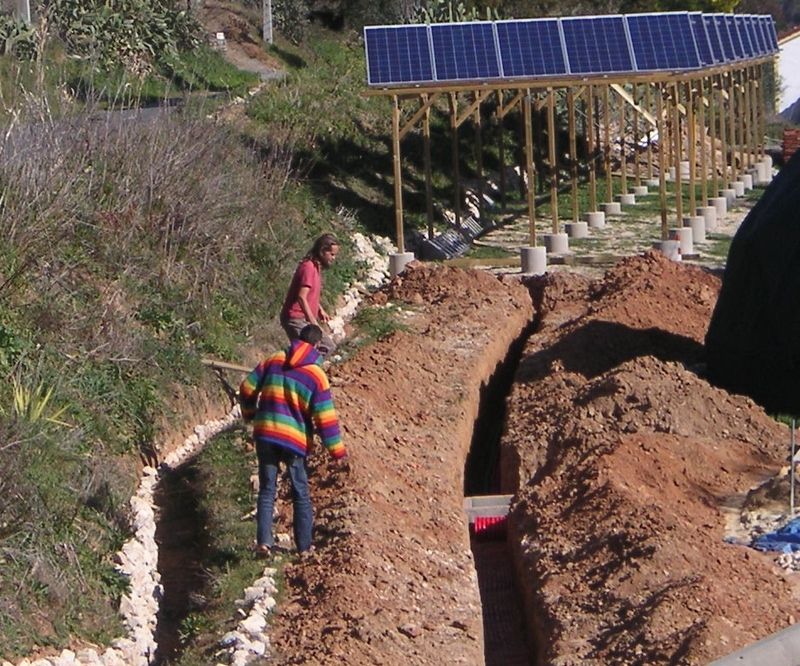 In this picture Narahari and Bert are looking into the conduit that connects the field of solar panels that was just installed over our parking area to the inverter. From there the power that we generate will be connected to the electric grid. Days are getting longer and the sun is up now in time for our morning meeting on the terrace. In the next week three people will be leaving after a long stay, three others will soon arrive. It helps us when people are here for extended periods. 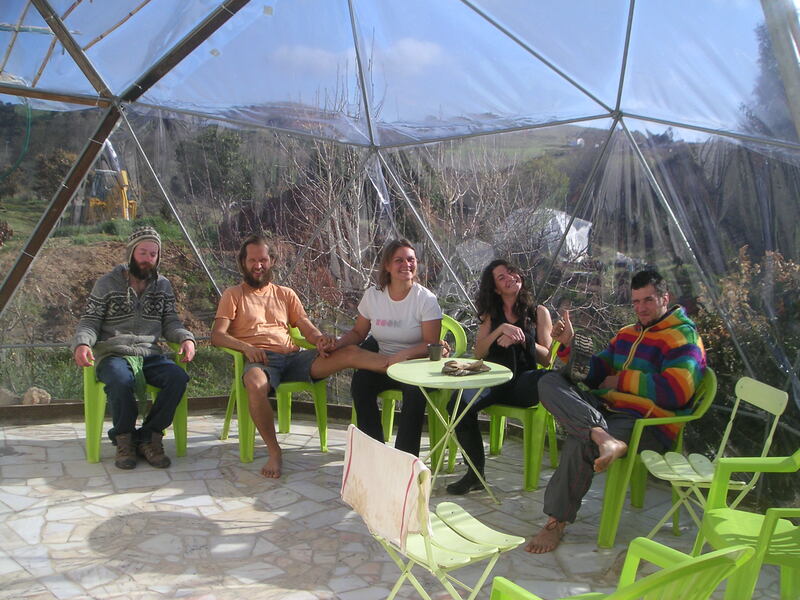 Not just volunteer workers under the wwoof conditions but also members who remain connected, identify with the project and share in the responsibilities.